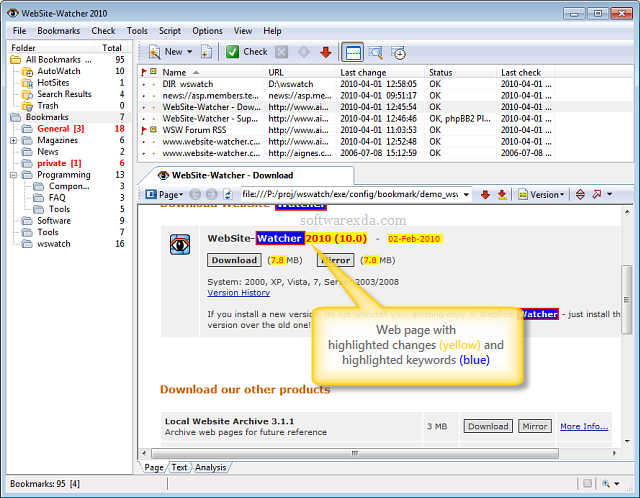 WebSite-Watcher is a powerful yet simple website monitoring tool. It automatically checks web pages for updates and changes. Automate your daily routine, boost your productivity! WebSite-Watcher is a comprehensive application that enables users to organize a list of favorite websites and track all changes. It can also be installed on USB flask drives for portability. Although not particularly intuitive, the interface is user-friendly and lets you organize multiple bookmarks into lists. When adding a new website, whether it requires login credentials or not, you can specify the type between webpage, forum, and RSS/Atom-feed. Alternatively, you can use predefined plugins to check a page.